We are a small independent Scottish nursery growing and selling a wide range of happy, healthy and hardy plants. These include old favourites and many unusual varieties of herbs, herbaceous perennials, grasses, trees, shrubs and plants for shade. Because we grow at 850 feet above sea level our plants are tough and well acclimatised to Scottish growing conditions. The majority of them are propagated and grown on site for at least a season so are fully hardy and tough enough to cope with our Scottish weather and soil conditions. We are also developing gardens to inspire and show you what can be grown in these sometimes challenging conditions. We are always happy to advise and help you get the very best from your garden. The nursery is situated at Whitmuir Farm on the A701 just south of Leadburn. We are one of an exciting group of businesses here, where you can spend an afternoon wandering around the nursery and gardens, see the farm animals on one of the farm trails, shop in Dancing Light Art Gallery and Junkshop Antiques and enjoy good food in the cafe and farm shop. Find us at Whitmuir Farm near Lamancha. We are 16 miles south of Edinburgh on the A701. We are 8 miles from Penicuik, 4 miles south of Leadburn junction and 2 miles north of West Linton. Please follow the brown tourist signs for Whitmuir & the Dancing Light Gallery. 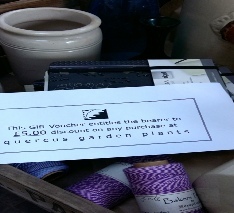 You can buy gift vouchers to any value From £5 upwards here on the website on the nursery shop page. We will post out free of charge.